Design cues that recognize an automaker’s past can be found on cars all over the industry. Some are small easter eggs and some are obvious enough to slap you in the face. These are the ten coolest design details that serve as throwbacks to a past car. The Chevy Silverado is America’s most iconic and identifiable trucks. If it weren’t for that recognizable face featuring the stacked headlight and split grill setup—something that dates back to Chevy’s C/K models—would they really be Chevrolet trucks? Maybe, but it just wouldn’t be the same. Hell yeah, it’s slightly inconvenient and most of the buyers probably haven’t paid attention to these auxiliary gauges ever, but it’s a throwback! And a damn neat one at that. Since the days of the C110 Skyline, these Japanese road devils have been outfitted with their unmistakable quad-oval taillight/brake light setup. Only now LEDs are used! 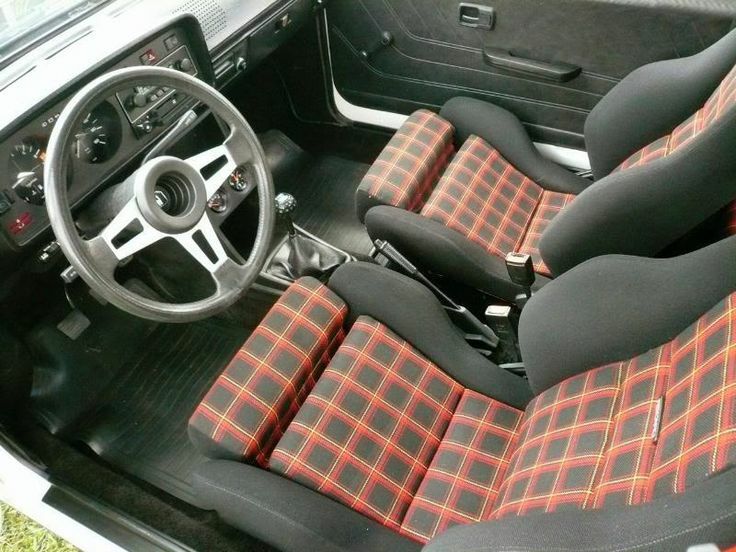 Kudos to VW for keeping those timeless plaid cloth seats inside their famous hot hatches for the seventh generation. Who needs luxurious leather when plaid cloth is an option? With the triple line inside the current generation Ford Mustang’s headlight, Ford is throwing it back to a unique piece of body styling from the first generation Mustang’s nose. No, it didn’t have LED DRLs, but it did have a triple-slash fish gill looking thing. Ah, the 911 Targa. There’s a car that does open-top fun right. To aim for top-level design, Porsche brought back their metal Targa bar design for the 991 models equipped with the Targa roof. What a great call that was. If you choose to opt for the electronic folding convertible top on the C7 Corvettes, between your two seats you can also find the historic Corvette “waterfall”. That weird panel thing is actually a throwback to the first Corvette convertible. If you’re not going for a GT3 or something that requires the extra racey aero, you have no reason not to ducktail your 991. Unless you’re having trouble finding the extra $4,400 to pay for the design package, then I guess an exception can be made. Sure they’re big, bulky, impractical and sometimes confusing, but the design is straight from the iconic Mercedes-Benz 300 SL! It’s not like they’re some tasteless butterfly doors or something. And they’re perfect for drive-bys! The coach doors on the Rolls Royce Wraith are an exceptional example of one of the fanciest ways to put doors on a car. They open backwards! And according to Rolls Royce, they’re also the biggest coach doors fitted to any production car. I would say the “coach” suicide doors with the very elegant, slightly raked back leading edge that’s almost impossible on a car with conventional doors, and strong almost upright C-pillar on the Rolls Royce Phantom Coupe that can go way back to the Phantom Coupe’s of the early 30’s. And the subtle swept line under the doors that throws back to the lovely flowing lines of the old cars with full running boards. It’s a timeless modern design with subtle throwbacks, that are not blatantly obvious retro features.